Every three months the next "Great Invention" promises to cure our planet of its ocean ills. Non-profits are formed, computer renderings are made, the press goes ga-ga. And nobody actually asks any questions. Because if we did it would fall apart; and we -so- want an answer that keeps us from having to make our own hard choices about our throwaway plastic lifestyle. This project will end up like all the others. The technology has not been thought through, nor has the vast expanse and incredible power of the oceans. It has not been developed, any more than Peter Jackson "developed" Barad Dur for the Lord of the Rings. But as long as we're talking about it, then we're not talking about holding the plastic industry responsible for its products, or consumers responsible for their habits. Which is pretty much exactly what industry wants. Please deploy your invention here: Midway Island, North Pacific Ocean https://www.facebook.com/photo.php?v=314263422009953 This video is about an island in the ocean at 2000 km from any other coast line. Nobody lives, only birds and yet, you will not believe what you will see here. Please don\\\'t throw anything into the sea. Unbelievable, just look at the consequences. Instead of looking at negatives I'd like to congratulate this young man for caring enough to take the time to think this whole thing through. Thoughts become things, choose the good ones. I think this idea is one of many that is coming to the table. The reality is that these qyres are overwhelming and the filtering of large plastic is not the only problem. Cleaning small particle plastic will also impact the environment negatively by destroying kelp populations. I'm glad I'm not the only one out there trying to put idea's together! Don't ever be discouraged, Boyan. Remember the number of scientists before you that were flogged, imprisoned, exiled, etc. for the work they did just because it was challenged by popular thought. If you did, we'd still be living on the flat world in the center of the solar system. If this is a true possibility then I am totally for it, I'll even donate! The ocean is not our dumping ground, whether intentional or not. This is wonderful. Now, make the cruise lines fund the construction and deployment of these things. Cruise liners dump multiple tons of garbage, because dumping and paying the pittance of a fine is cheaper than disposing of the garbage properly. Make China pay for a billion of these!! BRUCE POWELL: The garbage patch isn't supposed to be visible. It is an area where every drop of seawater simply contains a huge concentration of microscopic plastic particles. It consists of tons and tons of garbage, but it's particulate. It's a cloud. That's exactly what makes it harmful; much sea life would know to avoid large pieces, but as tiny particles,it gets taken in by filter feeders and fish fry and ends up in our food as well as causing nutritional disorder in wildlife. This is great but how about we attack the problem at the source??? I am always amazed and disgusted at the amount of plastic waste being generated in Asia and SE Asia. As a Merchant Marine Engineer i know first hand the tons of plactic trash clogging our rivers and harbours, catch it there before it get out into the open ocean. Great Job Boyan! Maybe this isn\'t the answer. I do believe that ideas like this one opens new ideas until we find a really great one. So I\'m glad this 19 year old came up with one that works. Now lets improve it with a better one. He\'s only 19, wait until he\'s 23! The U. S. Navy should be doing this right now . The Navy is charged with protecting us on the sea. By cleaning up the ocean and confronting those who pollute it - the Navy would be performing a great service to the US, the world, and the future. For the people commenting on here saying we should be focusing on reducing plastic at the source, yes that is true but it would also be nice to clean as much as possible out of our oceans at the same time. The article on this page is a glimmer of hope for hundreds of thousands of sea creatures that currently have their habitat filled with our rubbish and it should be celebrated in every way especially considering that the project could generate its own revenue giving it some kind of sustainability for the future. If you want plastic to be cut off at the source why not save some of that hot air that you are gassing off in these comments and put it where it is needed. To our governments and also our manufacturers of goods, or better yet come up with a viable alternative to plastic, get it on the market, work out how to offer it at a cheaper rate and then offer it to the companies that are distributing all of these plastic goods. This lad is has come up with a solution, and is working hard to make it a reality, would be good if more of us done likewise rather than dish out opinions all day. Young people being GOBAL CITIZENS. Business plan for SOCIAL INNOVATION. Combine advanced technology with forward thinking and environmental consciousness and what do you have??? S O L U T I O N S ! ! ! ! ! ! ! ! Beautiful Plan. Where do I go to see it? How about stamping down the plastic in boat-shape and then tie many of them together and then a GPS guided water engine drives it to the shore. We already have widely available technologies on the market that help reduce the stream of trash going into water bodies and ultimately into the ocean. That plastic water bottle casually thrown out of a car window? First it washes into a storm sewer that empties into a small stream. That stream goes to a river which goes into a bigger river which ends up in the ocean. Its so much easier to stop it at the source than to round up broken bits of plastic in hundreds of square miles of open ocean. We need more active enforcement of littering laws because that is a major source of the problem. A lot of the storm water infrastructure in our older cities is outdated. They have separators that filter out the \\\"floatables\\\" from the water, which are then collected and disposed of in landfills. Its really not that complicated! I wonder how often it would have to be emptied, too often and I'd think the feasibility would drop. Love the idea and hope it works!! I've sailed right through the so called garbage patch, from Tahiti to Hawaii, and Hawaii to San Francisco, and never saw a speck of man-made material. So I'm beginning to wonder how real this so called gyre is and how serious the problem is if you can't even see it when you sail right through it. What a bunch of nuts posting responses. 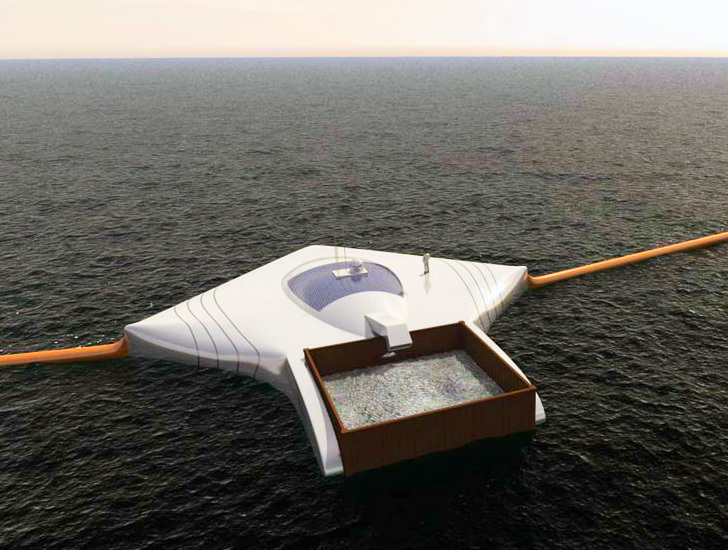 We can clean up what we have already left in the oceans AND we ALSO can think about how to reduce the input. This particular design is not going to sap away all the ingenuity in the world and prevent solving the use problem. Plastic companies love \\\\\\\"cleanup\\\\\\\"? That\\\\\\\'s great! There are plenty of things to cleanup. They are not going to invest in less production at the source? Don\\\\\\\'t blame the companies for that they change when their customers change. Look's slike a good Kickstarter project for sure. Wait, he's taking crap out of the ocean by putting more crap in the ocean ? I don't get it. You should find someone to set this up and solicit donations. I, for one, would donate if I knew it was an above board organization. Those Crazy Plastic Cleaning Machines Posted by Manuel Maqueda on Mar 27, 2013 in News, Plastic Pollution If I had a dime for each brilliant idea to “clean up the “Garbage Patch” that has been forwarded to me over the last few years I would be a millionaire. These gyre cleanup machines, devices and foundations that emerge periodically are not going to happen. However they are likely to get lots of media attention –and distract from the real solutions. These more or less sophisticated delusions and fantasies of massive offshore cleanups testify to how misunderstood our plastic pollution problem is, and how disconnected we are from nature in general, and from our oceans in particular. http://kumu.cc/2013/03/27/those-crazy-plastic-cleaning-machines/ What about stopping plastic pollution at the source? Wouldn’t that be a better use of our ingenuity, time and money? It also happens to be quite doable too The plastic industry loves distractions like the cleaning machines, because they put the focus on “cleaning up”, not on how their business of making disposable plastics is destroying the planet We live inside of an entropic culture addicted to process: doing, manufacturing, selling… However, many of our planetary problems call for quite the opposite: not doing, stopping, preventing, protecting, designing better, etc. Protective actions that are so simple to be noticed and valued by our culture. PLASTANIC ends up sinking in a modest storm, only to contrubute to the waste on the ocean floor. This is true genius thinking. You give us hope for the future. Time to set up the foundation to receive funds to actually build this thing. I bet we can get $5 from enough people worldwide to start funding this gig. Get some people/org. with the credentials & lets do it. The plastics industry needs to pay for this, at least in part. Simple but such a significant a solution to an overwhelming problem. Great. Let's put some wind turbines or solar collectors on them and get power from them too. I am so distressed about plastic in the oceans and how birds think it is food and die from it. Everywhere I look in the city, I see plastic. I hope and pray there is a way to avert this ecocide we are perpetrating on the marine environment. Bravo to Boyan for taking this on. Further thought- with peak oil and the rising price of fossil fuel products, recycled plastic is likely to become a much more valuable commodity than it is now. Cue the fishing fleets of the world to redirect their energies. At the heart of the above is the point that this kind of pollution is not really a technological problem, but an economic one. It could be cleaned up, a bit of investment in research would be certain to change innovative ideas such as Slat's into effective and efficient solutions, but who is actually going to foot the bill? With dead fish's exposed stomachs full of ocean 'plastic debris', it's time at least one solution has been found. Beyond the obvious benefit of the cleaning, we would also receive data pertaining to the extent of the problem. I'ts really Awesome Work.. God Bless you.. So many negative comments; So what if it only collects 30 - 40% of the plastic - its still 30 - 40% less that's floating around the ocean. Even if it only took out 10% its still better than doing nothing! And with the volume of plastic floating around the oceans, the revenue that could be generated by recycling it could fund the project adinfunitem! Having grown up working on fishing boats, then serving in the Royal Navy, I have visited many of the worlds oceans and they are now a veritable cess pool of human filth, we all campaign to "Save the Rainforest" and one of the key points used is the oxygen they produce. Plankton produces 2/3 of the earth's oxygen and we are killing it fast than the rainforests! This seems highly dangerous for the living creatures in the area. my question is how are they going to make a invention smart enough to sift threw living things and garbage. it is a great idea, but what about the fishes? i love it. i only hope we switch from the indestructible plastic we currently produce from petroleum to the biodegradable variety industrial hemp makes possible. Nice, I'll feel much less guilty littering with those things in the ocean. This is the best news I've heard in ages. Please get this realized for many reasons including the poor immense suffering of the albatross on Midway Island, and seabirds everywhere. Youth like this gives the planet hope. Awesome Idea. Someone below mentioned he works on a cruise ship and sees plastic out in the middle of the ocean. Why not attach some of these "booms" to the cruise ships and have them gather up plastics while they move about in the oceans. Once people see how much a single cruise could collect, they might think twice about using so much plastic. Fill a glass with water, then put in something that floats. Turn the glass. The floating particle stays where it is. The same applies for the booms - the plastic doesn't accumulate as it gets closer to the mouth of the boom. The amount of plastic removed is directly proportional to the amount of water processed. There isn't a hope in hell of processing the top layer of millions of square kilometres through centrifuges to remove the organic matter and capture the plastic. Current estimates are that it would take 79,000 years to clear and he claims it could be done in 5? Come on... Delft should be ashamed of themselves. If they hadn't given him an award, this would just look like the crackpot idea that it is. How much, and who pays for it? This is a wonderful idea and neds to be carried all with all speed. However there still remains the issue of tiny particles of plastics that are being found in the stomach of the tiniest fish and are there spreading throught the fod chain and back to us too of course. Awesome ! This is innovative , motivating and smart. Young people cleaning up the older generations unsustainable practices rather then blindly continuing to follow them! Working on a cruise ship I see. Tons of plastic thousands of miles out to sea. I really hope this gets done. And I really hope it works. WOW, Great initiative by this 19 year old! Plastics are a reality of life today, we depend on them for a myriad of vital needs, we need to move beyond useless "feel good" campaigns to ban it and start dealing with it intelligently. Anyone using a computer to comment on this article is using plastic. Anyone receiving medical care is using plastic. Plastic is not going away, ever. I admire efforts like this cleanup array and support progress towards re-engineering plastic consumer items to be a renewable resource, making use of the Cradle to Cradle mindset. It would be wonderful if this idea worked. 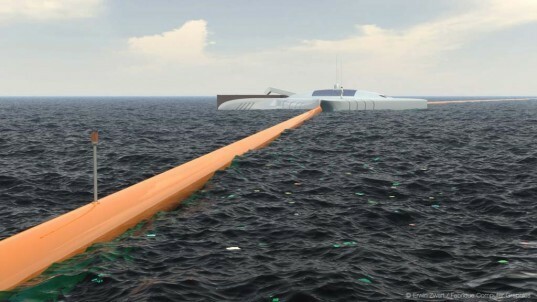 But I am worried that somehow the net benefit from the operation of this "cleanup array" will be negative. For example it may create more pollution (spilled oil or air fumes or something) than it will clean up. Or it will destroy more sealife than it will save. Or something... I would love to see an unbiased review from someone very knowledgeable, so we don\\\'t have to wait 5 years to find out. Add a high temp solar burner to melt the plastic into a mass or power. No fuel required except focused sun rays. Really an awesome idea..highly appreciated..Future expectation is, \"The same Technology can figure and to trash up the plastics in the landscapes\" rather than sea..Good awareness...!! How do you prevent accidental by-catch? Awesome! Also while I was sitting here reading I imagined a "bag-snag" for the stuff that isn't floating. A set of wires spaced far enough apart to allow aquatic life to pass through could remove more then half of the submerged grocery bags, directing them upward to the collection array. I see a lot of negative comments here. I think that this is a good step in the right direction. At least someone is TRYING to clean up the mess in the oceans. Every innovation we have ever been witness to has begun with the seed of a concept. Its OK to be critical but lets also admit that its a start. I for one am very proud of this young man and laud his idea. Lets see where some teamwork can take it. Trust the young to come up with a solution to fix a problem our generation created. This is a first step for a young man with a dream. How many times and millions have we seen on simpler Barrage schemes come and go and not come to anything. This is something desperately needed for all of us. First the dream then the reality. It takes on a life of its own and will engender the right help when its needed. Good luck Boyan. Keep the dream going and it will happen. . . .eventually. Great start. The only issue is that marine animals and birds will be attracted to this "island" and inevitably form its own ecosystem. The concentration of debris most likely would increase the incidences of animals ingesting the plastics in the funnel area so some kind associated sonic and or visual deterrent mechanisms would be mandatory. Nice start Boyan! A smart young man! He has done more to rectify the problems created by both companies, and people, which, in itself is a great undertaking. Someone needs to figure out how to undue the damage created by previous generations, since all they have managed to figure out is how to make the messes. He is 19. Amazing. We need more young people with their great idea to come forward!! There are real problems with this design - I'm surprised that it would win a technical design award, unless the judges knew nothing of gyres. For starters, the vast majority of the plastic is not on the surface or in the top metre, or however deep the booms reach. It's suspended at some depth, determined by the size and density of the particulate. Second, shipping lanes are based on the direction of currents, so orienting the booms parallel to them will result in inefficient collection. Thirdly, even if it was oriented across the currents, the length of the booms would not funnel the water and plastic unless the angle was far greater than shown. Fourth, given the waves and the likely inability for the booms to react to them, much of the water and plastic would presumably wash straight over the top. I'm all for the kid having a go - hats off to him! But we need to be realistic - we can't pat him on the back just because he's trying. We need to tell him why it won't work and ask him to please have another shot at it. This looks neat. How would it not collect fish? Before developing and deploying ideas like this we need the companies that make polluting plastic packaging and products to commit to redesigning their products and implement effective reverse logistics. Plastic pollution only exists because of failed design. Let's stop plastic entrring the environment. There is a danger plastic polluters will fund and co-opt ideas like this to allow them to greenwash and continue "business as usual"
There is one patch of floating plastic waste out there in the ocean that is the size of Texas. I heard about it 2 years ago, so now it is probably the size of Texas and Oklahoma combined. Bravo to the 19-year-old genius who has decided that something must be done about this terrible tragedy. I hope those in power can begin right away to do away with it. but from what I understand of his drawings, the booms need to be adjusted. (lots of cursing here -- but it was written at a time when there was a lot of anger about how a certain oil spill was handled.) see here: http://www.dailykos.com/story/2010/05/11/865387/-Fishgrease-DKos-Booming-School Also who is going to man and adjust these booms? Its a good idea, but I hope he thinks it through from engineering to HR. How does he solve the problem of deep-ocean anchorage? At the average depth of the world\\\\\\\\\\\\\\\'s oceans anchorage is either impossible or extremely difficult and expensive. I fear that the boom nodes will have to be held in place by ships using power to hold station and the scheme will become uneconomical due to fuel costs. what a wonderful idea!!! I hope the effen government doesn\\\'t Quash it!!! I don't drink beer, but I'd be willing to buy him some. What's the risk of catching fish and other forms of aquatic life in the device? Like others who have commented on this, one being the initiative, two being motivated, three being evolved and superior and last being wanting more of this interstellar project. Probably will be produced long after I'm gone . . .so from me "Bravo." excellent .. want more of this..
Well done! This young man\\\\\\\'s initiative and heart are commendable. Now if we can only get those that created the plastic gyres to be as ethically motivated and concerned about more than money, then we will have evolved into the superior species we claim to be. Simply amazing, I hope this gets enough funding to come true. I'm sure we all would be simply stunned at how much garbage is in the ocean, as mentioned here when it's all spread out it's difficult for us to visualize. Good luck with this project!